Century Park’s Going the Extra Mile program rewards associates for extraordinary acts of kindness. Monthly awards are presented in Century Park communities nationwide based on nominations from fellow associates, family members, residents and guests. Each community then chooses an annual winner, from which three regional winners and an overall winner are selected. 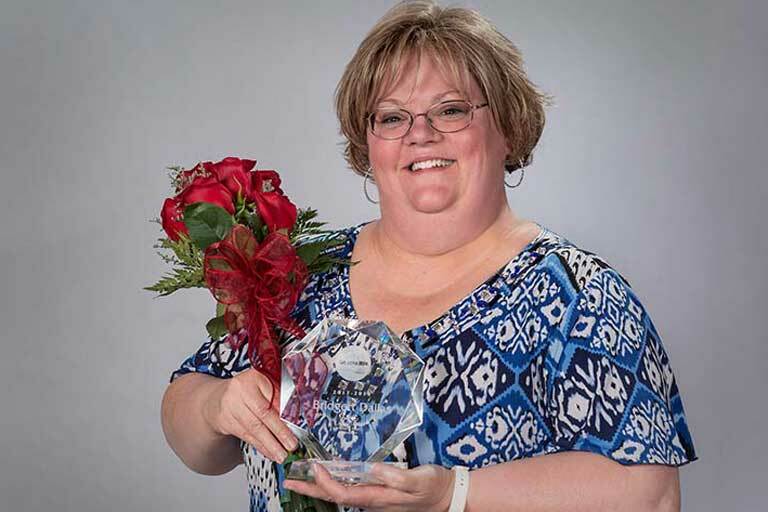 During Century Park’s Annual Management Meeting on May 10, Bridgett Dallas, lifestyle services director at The Bridge at Ooltewah, Tennessee, was awarded as this year’s overall winner from among Century Park’s more than 40 communities nationwide. Bridgett, who has been with the community since it opened in 2013, was nominated for her personal relationships with residents, knowing their likes and dislikes individually and taking time to pray with them. She also takes new associates under her wing and helps them get involved with residents, even if their jobs do not normally include a lot of resident interaction. As an activity director, Bridgett coordinated a week of Olympic-style activities during the Winter Olympics so that residents could participate and compete in scaled-down versions of the athletic contests, including curling. She even found a pool table for sale online when her residents expressed that they would enjoy having one in the community. She arranged for its purchase and delivery. “That’s Bridgett – if there is something her folks want, she is determined to get it done,” said Jenny Graham, director of operations for Century Park Associates. Bridgett is also involved with Quilts of Valor, an organization that presents quilts to veterans. She ensures that all veterans in the community, both residents and associates, are recognized for their service. “It takes a lot of extra coordination and planning to ensure no one is left out during the quilt presentation ceremonies we have had for the last two years,” said Justin Tipp, maintenance director. Bridgett added that her whole team works well together to help the residents lead fulfilling lives.